Yet another meal that doesn't get it's due because of my poor photo taking skills. Darn it! 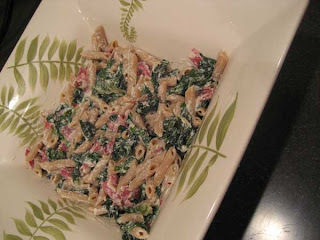 This time it was Broccoli Rabe and Salami Pasta, which you Rachael made on 30 Minute Meals. I am definitely a fan of the meal in a bowl thing, whether it's a stir fry or pasta dish that includes all your meat and veggies in on convenient location. So, this recipe jumped out at me when I saw Rachael prepare it - you've got your pasta, your meat, and your veggies all right there. If you're lucky (and luckier than me) your store will carry broccoli rabe. Mine has it about one out of every 10 times. Rachael recommends substituting kale or swiss chard. I usually go with the kale because they sell it prewashed in my store and you know I love a good shortcut. Bring 2 inches water in a deep skillet to a boil for broccoli rabe and 1 large pot of water to a boil for pasta. Salt the water liberally. Simmer the broccoli rabe in water 10 to 12 minutes, then drain [this makes it less bitter, so it's important to let it go for at least that long]. Return the skillet to medium heat with 1/4 cup extra-virgin olive oil. Add garlic and red pepper to the oil and gently cook a couple of minutes, add broccoli rabe and cook 5 minutes more. While the broccoli rabe cooks, drop the rigatoni into the boiling water and cook until al dente. Just before draining reserve 1 cup starchy liquid. Combine the ricotta, Parmesan, salami and black pepper, to taste, in a pasta bowl [I went heavy on the pepper and I'm glad I did!]. Add the starchy liquid and stir. Add the broccoli rabe and pasta and toss 2 minutes to coat and combine. This is one of our favorites too - easy, fast and keeps it interesting. A must try!